NETWORK FINALS: Game 2 of the NBA FINALS adjusted to 7.1, an impressive 0.06 above the final number for 2016’s Game 2. In addition, 60 MINUTES gained 0.1. CABLE HIGHLIGHTS: AMC’s FEAR THE WALKING DEAD topped Sunday cable, but its back-to-back 1.18/1.04 was sharply down from the 3.08 season premiere last year (in April), and even considerably down from the 2016 season finale’s 1.59/1.26. 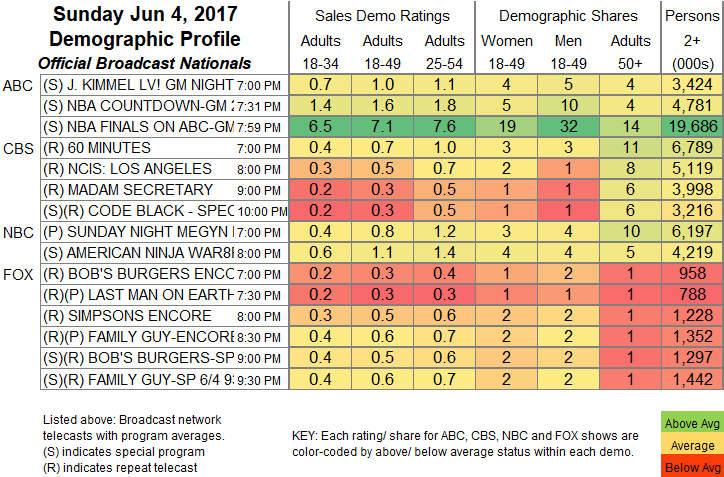 These are still substantial numbers for basic cable, but FEAR is moving in the wrong direction, and TALKING DEAD also returned at a low 0.36. It’s also going to be a long, long summer for Showtime, where I’M DYING UP HERE premiered at a miniscule 0.03/167K–and yes, it was available via VOD/streaming and even with a linear “sneak preview,” but there’s nothing that can make a number like that look anything other than dreadful. Note that episode 2 is already on VOD/streaming as well. DYING certainly wasn’t helped by its 0.08 TWIN PEAKS lead-in, which was up 0.04 from last week (episodes that had been available on non-linear platforms before network airing), but down 0.07 from 2 weeks ago (which weren’t). On HBO, the series finale of THE LEFTOVERS jumped 0.13 to 0.43, SILICON VALLEY held its lead-in with a 0.12 rise to 0.44, and LAST WEEK TONIGHT (which aired after a VICE rerun instead of a new VEEP) returned from a week off down 0.02 to 0.47. On Starz, THE WHITE PRINCESS finished a surprisingly solid run up 0.04 to 0.21, and AMERICAN GODS fell 0.05 to 0.21 (and PRINCESS was considerably stronger in total viewers, 868K vs 607K). Elsewhere in scripted, Adult Swim’s MIKE TYSON MYSTERIES rebounded from its Memorial Day weekend airing by 0.15 to 0.55, and DECKER UNSEALED was at 0.30. Hallmark’s THE GOOD WITCH rose 0.06 to 0.24. Comedy Central’s CLUSTERFEST special was at 0.07. The unscripted realm was led by Fox Sports 1’s afternoon NASCAR race at 0.63. On E!, KEEPING UP WITH THE KARDASHIANS also had a big post-Memorial Day rebound, up 0.21 to 0.63, and a lead-out episode of SECOND WIVES CLUB was at 0.22, with WHAT HAPPENS AT THE ABBEY pushed to midnight with 0.15, steady with last week’s 10PM airing. Discovery’s NAKED & AFRAID fell 0.05 to 0.50. On Food Network, FOOD NETWORK STAR gained 0.09 to 0.44, preceded by a COMEBACK KITCHEN hour at 0.37. On Bravo, REAL HOUSEWIVES OF THE POTOMAC edged up 0.02 to 0.41, and INVITE ONLY CABO was down 0.02 to 0.19. 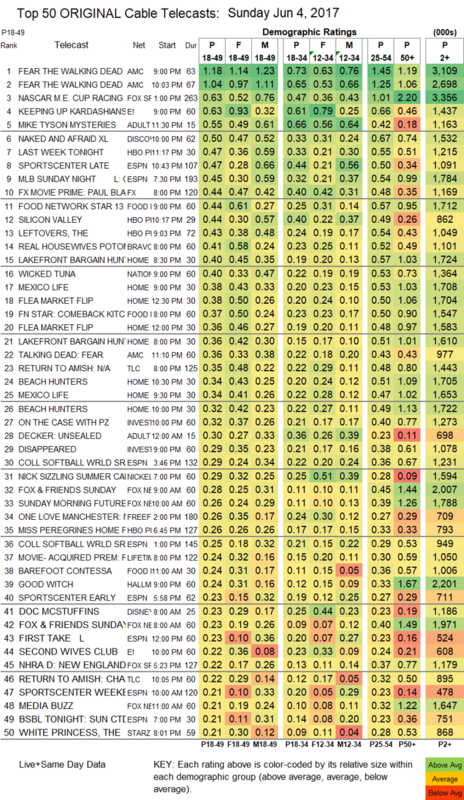 HGTV’s many shows on the chart were led by LAKEFRONT BARGAIN HUNTERS, up 0.06 to 0.40. The season finale of TLC’s RETURN TO AMISH gained 0.08 to 0.35, and the AFTER-SHOW was up 0.03 to 0.22. On ID, ON THE CASE WITH PAULA ZAHN climbed 0.06 to 0.32, and DISAPPEARED was up 0.05 to 0.29. Freeform’s live afternoon coverage of the ONE LOVE MANCHESTER concert was at 0.26.